Our unique waterproof eyebrow pomade is a long lasting cream-based pomade that glides onto your eyebrows with a thin brush for instant, well-groomed, full-looking brows. Available in five shades that cover the general spectrum of hair color, Miracle Brow® waterproof eyebrow cream adheres directly to the hair and skin and can easily build on itself to help define and fill thin eyebrows. Comprised of the finest natural vegan, kosher and organic ingredients, and with such easy application, we’re confident that once you try Miracle Brow®, you’ll toss your old eyebrow pencils in the trash! Layer with our Liquid Brow Liner or Tint for maximum durability and to achieve smear proof results. Find your complementing shade of Miracle Brow® eyebrow stain today and make your brows fuller and more in tune with your essence. Make sure the brow area is clean and free of oils, creams and lotions using LIP INK® Off Conditioning Remover then splash with water and pat dry. Using the spoolie brush, comb out the color to groom and blend the color evenly..
My brows have thinned because of menopause. My brows have gotten thin and light. I used a brow pencil that matched my brow color perfectly, but it is Summer and if I wipe my face; bye-bye brows. I had to find something that was more permanent. I found brow Ink! It's remarkable. It was so easy to use. Even with no makeup; guess who has eyebrows all the time? I DO!!! Thank you. i love this new product. It covers my brows nicely. Not what I expected . I will work with it and learn the amount to use that is best for me. This product comes in a pot with a nice thick product that makes it easy to apply and brush in to color and mold your brows to the way you want them. Sometimes mine are unruly. 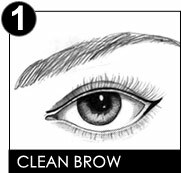 Actually I like using this product with the Miracle Brow Liner. I apply the Liner first then the Stain after.